Triangle shape buttons ensure the width of buttons efficiently. 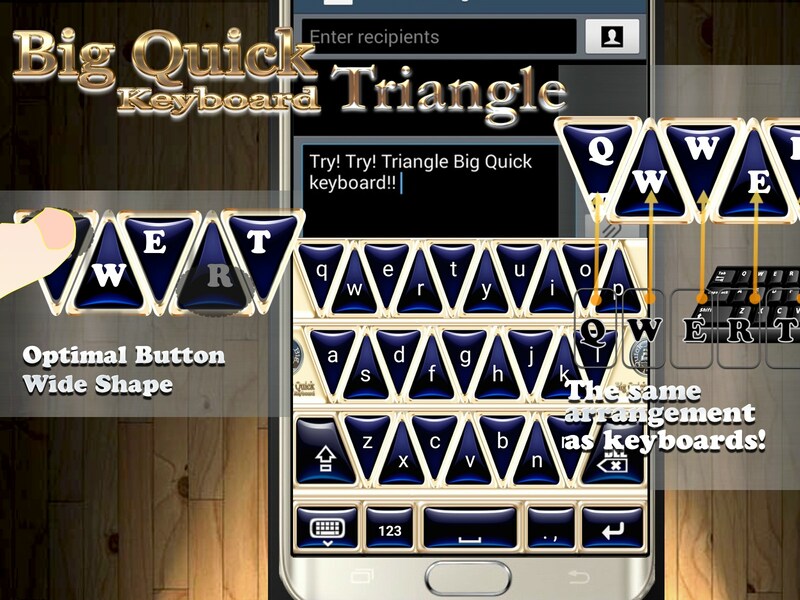 Triangle shape button keyboard app is now available globally on the Android Market. We use keyboard in smart phone almost every day. Therefore, keyboards are really as important as sound quality. It is very important to improve clarity in sound quality in phone. But we use keyboard for many conversations today. And it is important to find keyboard buttons easy and touch quickly in smartphone keyboard. But it was very difficult to replace traditional methods. The ‘Big Quick Keypad-Triangle Button Free’ not only has wide buttons more than twice traditional QWERTY keyboard buttons but also has the perfectly same arrangement as a keyboards by triangle buttons. It’s very different from the old version Big Quick Keyboard's method. It’s a whole new method. This keyboard have triangle buttons and arrange buttons uniquely. There wasn't a triangle button Keyboard yet. The triangle button keyboard is now available globally. These buttons have triangle shapes. The button arranged next to one triangle button is arranged in shape turn upside down. And it is repeated. It makes more wide buttons than rectangle buttons. And users can find buttons more easy than the other wide button keyboard apps. Because it’s arrangement is perfectly same as the traditional QWERTY keyboard’s arrangement. The other Big Quick Keyboard app released 7 months ago is also same as the traditional QWERTY keyboard’s arrangement but it has the divided buttons array. It can cause a little confusion and slower speed than newly-developed triangle buttons. Although it also has the same arrangement as a keyboard and wide buttons. When users touch smartphone, users thumb finger mark shapes are wide oval shape. So wide buttons are very easy to use. Wide button shape is a optimal shape. Triangle shape button ensure the width of buttons efficiently. 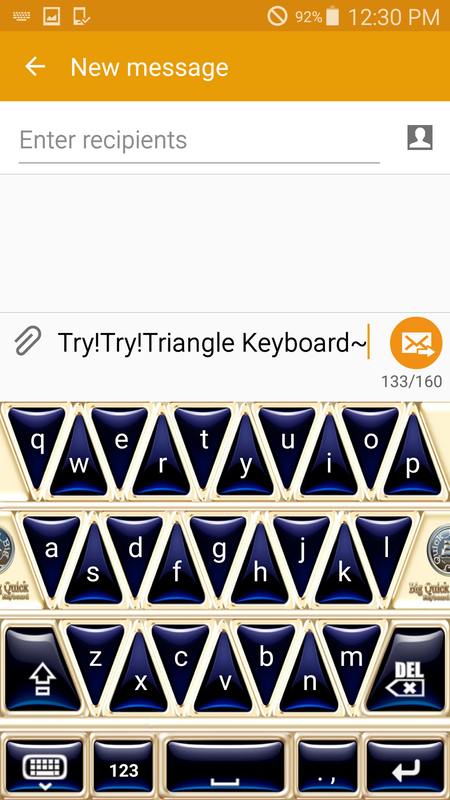 The width of this triangle button is more than twice traditional QWERTY keyboard buttons in smartphone. 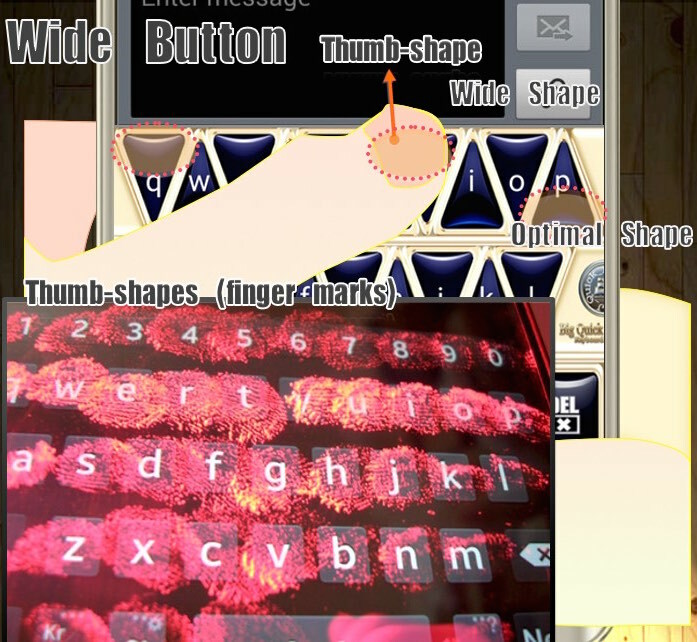 This triangle buttons keyboard app was invented by the developer YoungJae Lee. Instead of the rectangle buttons QWERTY keyboard, this mobile keyboard app can exceed users' current typing speed on the rectangle buttons in very short spans of time. 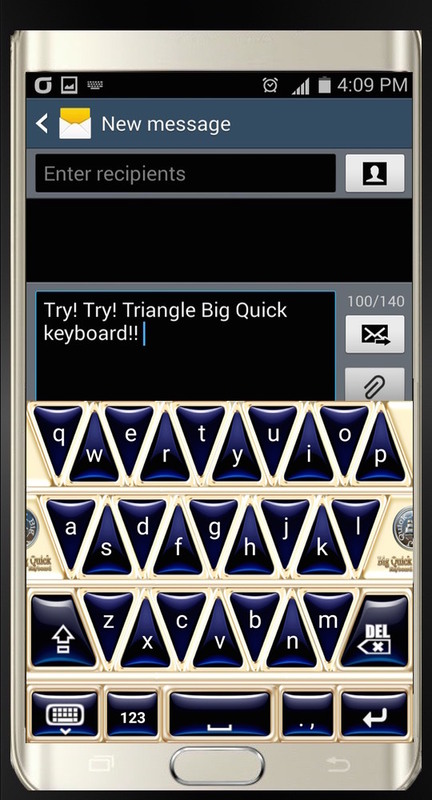 The ‘Big Quick Keyboard Triangle Button’ can be one of the essential app. Usually users can touch buttons without mistakes easily by touch a wide part of a triangle shape. This keyboard app is very easy to use. Please try it. This app is now available globally on the Android Market for smart phones. The full version was added to the Android app store. People must exchange a mobile phone to improve clarity in sound quality in phone. But users don't need to pay much money to improve quality in keyboard. And Android users can download a free version by visiting: https://play.google.com/store/apps/details?id=mobile.keyboard.nowdo.bigkeyboardentrifree. Also Android users can download a full version(4.5$) : https://play.google.com/store/apps/details?id=mobile.keyboard.nowdo.bigkeyboardentri (1$-now sale on). Please visit http://quickjgo.com for more information.